But we were here first!! You've spent the last few hours getting to the airport, trailing around the terminal, queuing to get on the aircraft and now you're finally settled into your seat as you taxi towards the holding point. Straining to see out of the window you try and count the number of aircraft ahead of you attempting to work out how long until you'll be in the serenity of the sky, getting excited as you approach the front. The one ahead enters the runway and you hear the dull rumble as they apply the power knowing you're next, then all of a sudden another aircraft appears and lines up, then another and one more. You start thinking to yourself that this isn't fair, you were there first why aren't you going? Why did that flight takeoff before us? While it is a simple question, it is far from simple to answer it! There are multitude reasons which must be considered when deciding the departure order from the direction the aircraft will fly to how big they are, from restrictions on the flight to weather. To make things more challenging none of these reasons work in isolation, each one impacts the others making the decision who goes next a multifaceted challenge. These rules which prescribe the minimum time between successive departures is referred to as separation. In this post I'll explain the two most common factors and expand to others in later posts so you'll hopefully have a little more understanding why 4 aircraft may go before you or why that one random aircraft comes from the back and takes off before everyone else. I would like to note this is a fairly simplistic version to make it accessable for all, but if you have any further questions feel free to ask. The reason we don't depart aircraft in a first come first served basis is that we're attempting to maximise the use of the runway and to 'loose/waste' the least amount of time. In an ideal world an aircraft would takeoff, immediately another would takeoff and this would be repeated continually. If an aircraft has to wait on the runway for a period of time rather than departing immediately it is said that you're wasting/losing time. As I will explain in the future paragraphs/posts you will see that there are times when you can't help but lose some time, but the idea of the game is to order the traffic in such a way that this happens the least amount of times as possible. Airport schedules are based on a nominated minimum departure rate, or number of aircraft getting airborne per hour, therefore if the controller is unable to order the traffic to attain this rate it may introduce delays for traffic ready to go at the gate. In order to add some perspective at busy airports they need to depart 50+ aircraft an hour and therefore you're only able to loose time a maximum once every 10 minutes. Here is probably a good place to highlight that all departure separations are based on the time an aircraft takes off. So if a separation requires 1 minute spacing that means that the 2nd aircraft needs to get airborne 60 seconds after the time the first one got airborne. Therefore you have to be a little creative with when you roll aircraft. For example if BAW123 got airborne at 12:14 (that's 12 minutes, 14 seconds past the hour) the next aircraft should not be airborne until 13:14, subject to it been a 1 minute separation. So if the next aircraft to go is a jumbo, you can roll it almost immediately as you know their roll will be at least 1 minute, however if the next to go was a Citation you will have to wait a little bit as their takeoff roll may only be 30 seconds. In that case you many not roll the citation until 12:44 so it would be airborne at 13:14. Simple eh?! The first separation we will consider is route separation, or simply the direction the aircraft will fly after takeoff. If aircraft took off and flew in whatever direction they liked it would be near on impossible to know how long you needed to wait until it was safe for the next aircraft to depart. In order to solve this issue major airports have SIDs (Standard Instrument Departures) or set routes that aircraft follow after takeoff. Below is a fictional example of 4 routes out of an airport, A, B, C and D. An aircraft wanting to go North would fly the red route, A; one wanting to go towards Spain would fly the green route, C.
Starting on the left you choose the departure routing of the first aircraft, then move across to the routing for the second aircraft and read off the minutes required between them. A followed by C would be 1 minute, B followed by C would be 2 minutes, D followed by D 3 minutes, etc. A (2) A (1) C (2) D (1) B = 6 mins. A (1) D (1) B (1) A (1) C = 4 mins (2 min saving). D (1) B (2) B (1) A (1) D = 5 mins. D (1) B (1) A (1) B (1) D = 4 mins like before, but now we have achieved our minimum 3 mins between D's and 2 mins between B's. In these examples we're just working with 5 aircraft, as you can imagine if you extrapolate these savings/losses over the course of an hour, morning, day, etc the massive difference it can make to the efficiency of the airport by just changing the order they depart in subtly. Aircraft are grouped into one of 6 categories based on their takeoff weight for wake turbulence purposes and there are minimum time intervals that must elapse between departures of particular groups. For example 2 minutes must elapse between a heavy aircraft followed by a medium, but there is no wake turbulence spacing required if it is a medium followed by a heavy. Similarly to route separation it makes sense to depart aircraft after each other which have no wake turbulence separation requirements, this is why you'll often see a lot of small aircraft go in a row followed by lots of large aircraft. Now if you remember how I said each separation was intertwined, this is where we can get clever. If you have a heavy departing on route A and a medium aircraft on route A you will require 2 minutes for wake turbulence separation, but it also means you achieve 2 minutes for route separation too. It's almost like a 'freebie' loss of time as you've achieved two separations in one movement. I think that's enough to ponder for now! Next post we'll start to look at slots and departure restrictions and how they impact on the 'perfect' order. As I said at the beginning this is a very basic overview so that those with little aviation knowledge can hopefully understand, but if you want further information or questions please feel free to get in touch. The simulator is ready, the crew are ready. We are now all heading to the simulator ready for this evenings fun. Only thing left is to mount the new camera more securely as it fell down over night! Today Mark has been busy 3D printing a house for the new motor, sans Le flames. There comes a moment in life when you can always remember where you were, who was there, the smell, the sounds, etc. This moment happened for me today, when two great minds met.. So Einstein when do you think you should flare?! As pilots it is important to always assess your performance post flight, what went well/wrong, where could we improve, etc. Simon and Dan have just pushed back in Corsica on their way to Gibraltar, followed by another 5 legs ending up back in Heathrow. Come say hello on the stream and don't forget to donate! After a rather long break the simfest guys are spending the weekend in Ralphs 737 simulator flying around europe. Something very strange happened... Benny turned up in a shirt! And Gary has got organised! With only 4 hours to go until the start of Worldflight the crew have been busy today getting supplies and doing some last minute technical changes and fixes. Dan was in charge of finding us a selection of world beers which matched our route. So that this doesn't appear to just be a booze cruise we also need to fill in a form outlining our thoughts about each one. We also got a little bit of food to get us going until Monday when we can do a 'proper' shop. Meanwhile Mark has been busy installing and writing code to make the motor in the throttles work to move them with the autothrottle. ... WorldFlight and every single creature was stirring getting everything ready for tomorrow. One member Peter (Britjet) has been extremely busy finishing off the Route Guidance Manual which we're now delighted to release to you all. The manual gives you information and tips for each of the 45 legs in a humorous yet in-depth manor. The guide is 62 pages long, over 66,000 words and has taken Peter well in excess of 500 hours to create so you can have the benefit of the experience and knowledge of a real world Training Captain we rely on so heavily as a crew. As an added bonus for Aerowinx PSX users, the highly accurate Boeing 747 software we use in the simulator, he has also enclosed SITU files for each leg. All you need to do is load up the SITU of the leg you want to join in on and you'll be all set ready to go.. although you may need to move stands if everyone has loaded up on it! These sort of guides cost the real airlines millions of pounds and we would like to think that everyone who uses the guide will donate what they can to our cause this year, The Cure Parkinson's Trust. Also don't forget anyone donating £25 or more throughout the WorldFlight event will get entered into the draw to win a copy of Aerowinx PSX ! Thank you for your support, we'll see you live in just over 24 hours! So what's been happening recently at Simfest HQ? We have a new GoPro for the back of the simulator which means we're no longer reliant on borrowing one. Some of you who may of seen our stream yesterday may of seen it turning itself off repeatedly.. we think we've fixed that. Mark has been very busy soldering another circuit board for the left hand Audio Control Panel, which will mean the captain will be able to control his own radios and volumes directly through the ACP, rather than the spare pilot having to do it. Mark has also created a truly authentic audio mix solution meaning that each crew member has autonomy of which radios they're listening to, the volume they're at and who they're speaking to. No longer do you need to suffer flying along with someone who likes the volume at full blast or struggling to hear as the other bloke wants it at minimum. It also means for the first time that one pilot can be liaising with dispatch on the SATCOM while the other monitors the radios, rather than it all been cacophony of sound. We now have an authentic parking brake with authentic slam as it disconnects itself, it's very satisfying to hear. There is only one problem at the moment is that the solenoid that works it gets very, we mean very, hot and therefore we have to limit its use otherwise there is a good chance it'll set fire to the whole of the centre pedestal! Bonus points for those watching on Twitch who can identify our non technical solution! The autothrottle motor is now in the simulation and just requires calibrating and setting up - it should be working for WorldFlight. There is something very satisfying seeing the throttles move forward as you hit TOGA on departure, or in Ron's case during the approach several times. As you can see we've been really busy and had very little chance to fly the simulator, however we're hoping to do a little either Friday evening or through the day on Saturday so make sure you're following us on Twitch to see when we go live. -Replacing the audio intercom system to make each ACP independent and function like the real aircraft. This has the bonus of only transmitting the mic of the person hitting transmit. This should avoid the comedy moment when someone says something very inappropriate over the radio ! -Rearranging the instructor station monitors so we don't have to crouch down to read the text! -Ordering 152 world beers for the passengers to sample at various destinations around the world! and lots more I have forgotten! Only 6 days to go! Good evening followers of Simfest! As we close in on a week to go to the start of Worldflight we would like to announce our first competition! The winner will be awarded the scenery for an airport of their choice on this years route. In order to enter you just need to donate £5 or more via our Justgiving or Twitch donation pages, that's it! Entries for the scenery close at 2359z on 30th October when a donation at random will be chosen. 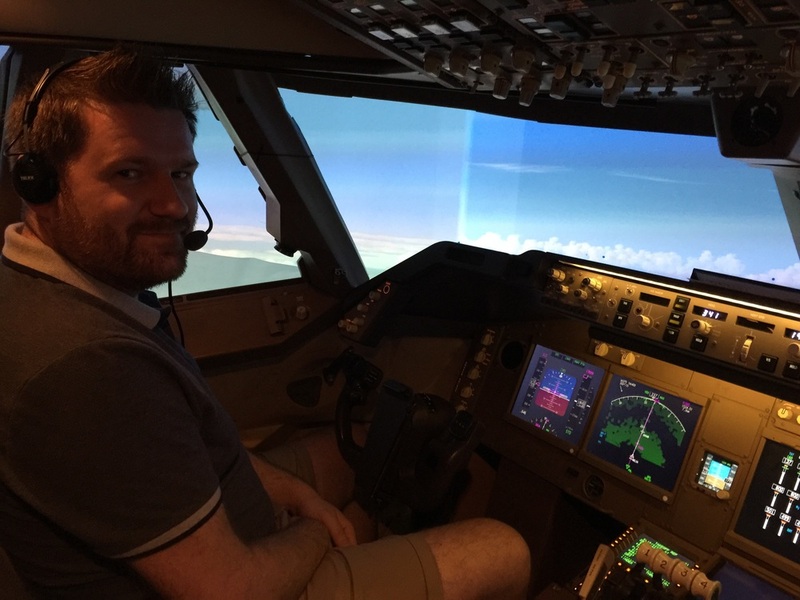 Britjet, our Training Captain, has been very busy over the last couple of months flying each leg of WF on his simulator at home to produce the Simfest Route Guidance Manual and is now ready to release the first 25 legs. This manual is very similar to that used by real world crews containing information about the airport, terrain, procedures, etc. He's also included points of interest for you to look out for along each leg which will hopefully keep you entertained when you tire of our ugly mugs on the Twitch stream! For those who will be using Aerowinx PSX 747 Simulator he has also included the SITU files for you to use that will get you to the right place, set up correctly to start the engines and go. Britjet has spent hundreds of hours flying and re-flying each leg to make the guide as comprehensive as possible and therefore we ask you to consider donating to our charity of the year in way of recognition of your enjoyment reading and using his guide. Be sure to mention it's for his RGM in the message box as I am sure this will drive him to complete the last 20 legs ASAP. This is London calling, London calling..
Short notice but team member Ralph has been invited to take part in a discussion regarding Worldflight on Skyblue radio this evening in 20 mins or at 1900z. Im led to believe you'll also be able to listen retrospectively if you can't get to the stream tonight. Is it only just over 3 weeks!? With just over 3 weeks to go to Worldflight we've started updating the webpage which is available here. We're still in the process of writing the Route Guidance Material, Flight Plans, etc so keep checking back for new stuff! In other Simfest news we've updated the sim to P3D V3 and upgraded the projectors for a better outside view. We ma do some streaming this weekend to test a few things but that's very much dependant on what we're doing working! Make sure you follow us on Twitch to receive notifications when we go live. We've been a little quiet as the various crew members take a break at the end of the summer. Never fear though behind the scenes we've been busy sorting our next event which we shall be announcing shortly. In other news the crew have ordered their T-Shirts for this years WorldFlight and Britjet has been busy starting the route guidance manual. Can you guess which route this picture is from? Christine and Emily baked our cake and then proceeded to decorate our cake on Saturday night. I am sure you will agree it looks absolutely superb, the team are delighted. Please stop by their stream or visit their Facebook page and say hello. I'd like to hope that during WorldFlight we'll be able to arrange a cook along one evening.. stay tuned for that. In other good news a long time follower and supporter in the stream, Chadders and his wife welcomed their second child over the weekend. Please join us in congratulating them all. Today and tomorrow some of the Simfest team are attending VATSIM-UK Live. This event sees around 50 members of VATSIM get together in a conference centre near Birmingham flying and controlling together. Although we won't be streaming as we've only got bits of the sim it would be great to see some of you in the skies with us. There will be loads of ATC coverage throughout the UK so you're guaranteed to get to talk to someone! In other exciting news, tonight Cooking For Noobs will be baking our 747 cake tonight at around 2100z. Please tune into their stream and support them, they are a really amusing pair of ladies who have done so much for our stream already.